Great service and food. Really enjoyed the night. 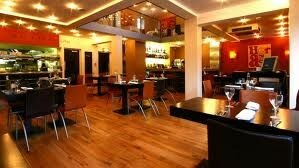 Fantastic food, services and atmosphere. My family and I will definitely continue to return here. There are cheaper restaurants in the area, but in a well run restaurant, you only get what you pay for! Beautiful Restaurant! Wonderful meal as always, Friendly staff with a 'nothing it to much trouble' attitude. Amazing cocktails and a good selection of Gins. Overall average is the best I could give, our waiter was very nice, but it went down hill from there. Starter of fish cake was dry, other starter ok.
How can you get two of the same main courses so different, one good,the other lacking in flavour and meat, it should have been called mushroom stroganoff. Great food, staff are a credit to the restaurant. Thank You a great night out. Love this place. Favourite restaurant - food is always amazing , staff are absolutely lovely and the place is clean with fab decor - don't change anything please!! Service was fabulous, staff are very friendly and helpful. The food we had was delicious. Regular visitor, always great food and service! Great food and fantastic service. We'll definitely be back! Food was great, great quality and the staff very attentive, great service. On my third visit, I enjoyed the same outstanding service, a wide range of delicious food and drinks and reasonable prices. I look forward to returning soon. Another brilliant visit - amazing food, fab service, great atmosphere...what a treat!!! My daughter is vegan and I'm wheat/dairy intolerant so we both had the vegan pizza with extra olives, mine on a gluten free base. Was surprised how good it was, we both agreed it was nicer than the well known chains. Excellent service and a great atmosphere, would definitely recommend. Easy to book online. We visited to celebrate the 21st birthday of my youngest daughter. We really enjoyed the food.....and drinks. The restaurant had a good atmosphere and the service from the staff was excellent. Food very good and service was very friendly.